Today New Horizons will make its closest flyby of the planet Pluto. During the flyby it will be capturing new imagery and data from the minor-planet. New Horizons will pass Pluto at just 12,500 km from the surface. If all goes well New Horizons should contact Earth again at 01:53 BST. NASA's current best map of Pluto is available as a kmz download, which can be viewed in Google Earth. This map was created last week from images taken by New Horizons. A full-frame picture of Pluto was also captured yesterday. NASA is expected to release that image today at the moment of New Horizons' closest flyby of Pluto.. NASA has now posted that image to its Instagram account. 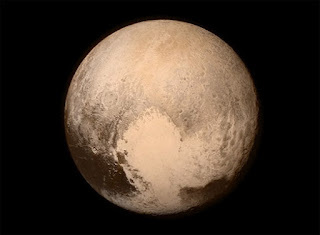 The images of Pluto captured today will be at a fraction of a kilometer per pixel. However Pluto is more than 4.5 billion km away from Earth. This means that it will take 16 months to send back every piece of data captured from New Horizons' flyby of Pluto. Because of their high science value (and due to high public interest) the first high-resolution pictures of Pluto should be downlinked tomorrow. The rest of the image data from New Horizons will begin to be downlinked in September. It will then take 10 weeks to download the full data set. This means we may have to wait until the end of November to see the best maps of Pluto.